MINNEAPOLIS — As the Labor Review went to press, March 31 was looming as life-altering deadline for thousands of Liberian immigrant workers and their families who have put down roots in Minnesota. Liberian refugees initially came to the United States in 1991, fleeing civil war in their country, and have been able to continue to build new lives here thanks to President George W. Bush’s 2007 decision to provide Deferred Enforcement Departure (DED) and also to provide authorization to work. Over the years, Bush’s initial decision continued to be extended — until March 2018, when President Donald Trump announced that he would allow DED to expire March 31, 2019. Trump’s move has put the lives of Liberians living in Minnesota in turmoil, including members of the Service Employees International Union, Minnesota Nurses Association, and UNITE HERE Local 17. More than 5,000 Liberians living in the U.S. are impacted by the prospect of DED expiring — and the majority live in Minnesota. Numbers are only numbers but remembering that each one represents a real person with a family and a real life story is important. Fotana. She came to the U.S. from Liberia in 2002 at age 38 and has worked since 2003 as a nursing assistant at United Hospital in Saint Paul, where she is a member of SEIU Healthcare Minnesota. Another important reason brought her to the U.S — seeking specialized medical care for her then 7-year-old son. Now 24, he’s faced continuing health challenges and, she worried, he might not survive if the pending change in policy forces them to return to Liberia, where he would not receive the same quality of health care. Finding a new home in Minnesota away from the war in Liberia, Liberians here have worked, joined unions, paid taxes, purchased homes, started businesses. They have children who either came to the U.S. so young that they have known only life here or who were born in the U.S. and are U.S. citizens. 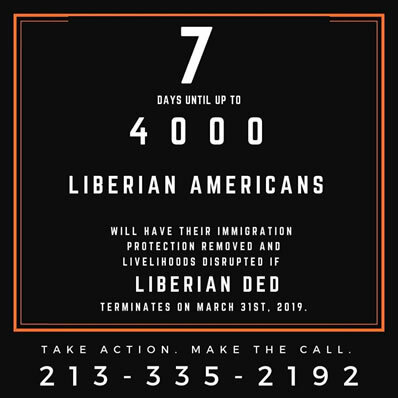 DED’s expiration could lead to the deportation of Liberian-born parents and separate them from their American-born children. Renewing DED for the impacted Liberians or creating some other path to residency is up to the discretion of the President. Congress also has the power to act. As the Labor Review went to press March 11, U.S. House Democrats planned to include renewing DED in a new version of the DREAM Act. In the U.S. Senate, Minnesota Senator Tina Smith reportedly supports a similar measure. Calls are urged to Senator Amy Klobuchar to ask her to make DED a priority and to also help convince her Republican colleagues to vote for DED when the measure goes to the Senate. Contact Klobuchar’s office at 202-224-3244 or 612-727-5220.